Indusparquet Amendoim Plank 5/16" and 7/16"
Amendoim is either a 5/16" thick x 3 1/8” wide or 7/16" thick x 2 5/8" wide, prefinished, solid hardwood floor. It is precision milled for a perfect tongue-and-groove fit with micro beveled edges and ends. This product features a UV cured aluminum oxide Semi-Gloss Finish including a 24-Year Limited Warranty. Amendoim’s reddish brown hues combine with darker striping that is accented with a unique wavy grain variation. Its color darkens with exposure to light. Color stabilizes approximately three months after installation. Amendoim Plank can stapled or glued down to wood subfloors or glued to concrete on or above ground level. Indusparquet Angelim Nero Plank 5/16"
Angelim Nero Plank is a new item from Indusparquet . At 5/16" thick x 3 1/8” wide, this prefinished, solid hardwood floor is precision milled for a perfect tongue-and-groove fit and has micro beveled edges and ends. This product features a UV cured aluminum oxide Semi-Gloss Finish including a 24-Year Limited Warranty. Its dark espresso colored stain accentuates the interlocking grain pattern. Naturally occurring crystalline compounds are found randomly throughout the species adding a signature statement and unique character. Angelim Nero Plank can stapled or glued down to wood subfloors or glued to concrete on or above ground level. Angelim Plank is a new item from Indusparquet. At 5/16" thick x 3 1/8” wide, this prefinished, solid hardwood floor is precision milled for a perfect tongue-and-groove fit and has micro beveled edges and ends. This product features a UV cured aluminum oxide Semi-Gloss Finish including a 24-Year Limited Warranty. Its rich amber colored stain accentuates the interlocking grain pattern. Naturally occurring crystalline compounds are found randomly throughout the species adding a signature statement and unique character. Angelim Plank can stapled or glued down to wood subfloors or glued to concrete on or above ground level. Industparquet Brazilian Cherry Plank 5/16" and 7/16"
Brazilian Cherry Plank (Jatoba) is either a 5/16" thick x 3 1/8” wide or 7/16" thick x 2 5/8" wide, prefinished, solid hardwood floor. It is precision milled for a perfect tongue-and-groove fit with micro beveled edges and ends. This product features a UV cured aluminum oxide Semi-Gloss Finish including a 24-Year Limited Warranty. This species has a natural reddish brown color and superior hardness. It features distinctive and varied grain patterns and matures to a beautiful, rich mosaic. 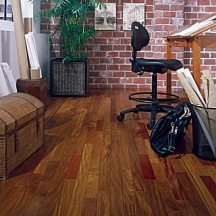 Brazilian Cherry Plank can be stapled or glued down to wood subfloors or glued to concrete on or above ground level. Industparquet Brazilian Hickory Plank 5/16"
Brazilian Hickory Plank is a new item from BR111. At 5/16" thick x 3 1/8” wide, this prefinished, solid hardwood floor is precision milled for a perfect tongue-and-groove fit and has micro beveled edges and ends. This product features a UV cured aluminum oxide Semi-Gloss Finish including a 24-Year Limited Warranty. Dark brown to nearly black hues combine to create a rich espresso color. Distinctive graining complements the rich mosaic. 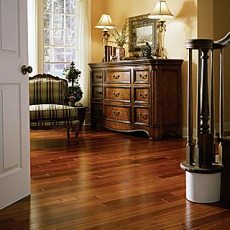 Brazilian Hickory Plank can stapled or glued down to wood subfloors or glued to concrete on or above ground level. Industparquet Brazilian Teak Plank 5/16"
Brazilian Teak (Cumaru) is a 5/16" thick x 3 1/8” wide, prefinished, solid hardwood floor. It is precision milled for a perfect tongue-and-groove fit with micro beveled edges and ends. This product features a UV cured aluminum oxide Semi-Gloss Finish including a 24-Year Limited Warranty. Cumaru's color includes yellow, tan, and dark reddish brown hues that when coupled with its unique grain pattern creates a distinctive natural feel. Its color is mostly unaffected by exposure to light. 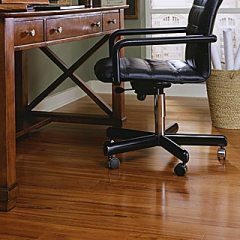 Brazilian Teak Plank can stapled or glued down to wood subfloors or glued to concrete on or above ground level. Industparquet Brazilian Walnut Plank 7/16"
Brazilian Walnut (Ipe) is a 7/16" thick x 2 5/8” wide, prefinished, solid hardwood floor. It is precision milled for a perfect tongue-and-groove fit with micro beveled edges and ends. This product features a UV cured aluminum oxide Semi-Gloss Finish including a 24-Year Limited Warranty. 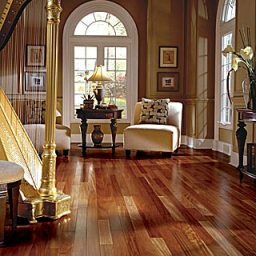 Ipe features a distinctive range of dark red, brown, and nearly black hues that mix to form an exotic and rich dark brown color. Graining varies substantially and its color is mostly unaffected by exposure to light. 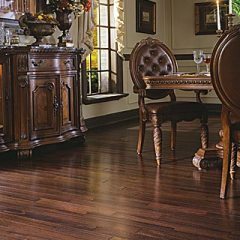 Brazilian Walnut Plank can stapled or glued down to wood subfloors or glued to concrete on or above ground level. Industparquet Macchiato Pecan Plank 5/16"
Macchiato Pecan Plank is a new item from BR111. At 5/16" thick x 3 1/8” wide, this prefinished, solid hardwood floor is precision milled for a perfect tongue-and-groove fit and has micro beveled edges and ends. This product features a UV cured aluminum oxide Semi-Gloss Finish including a 24-Year Limited Warranty. Tan to blonde colors mix with dark browns creating a dramatic character unique to this species. The rich mosaic is further enhanced with distinctive graining. Macchiato Pecan Plank can stapled or glued down to wood subfloors or glued to concrete on or above ground level. Industparquet Santos Mahogany Plank 5/16" and 7/16"
Santos Mahogany Plank (Cabreuva) is either a 5/16" thick x 3 1/8” wide or 7/16" thick x 2 5/8" wide, prefinished, solid hardwood floor. It is precision milled for a perfect tongue-and-groove fit with micro beveled edges and ends. This product features a UV cured aluminum oxide Semi-Gloss Finish including a 24-Year Limited Warranty. This species reddish brown to deep red color remains stable after installationand features a unique grain variation that adds an exquisite touch to any application. Its color is mostly unaffected by exposure to light. 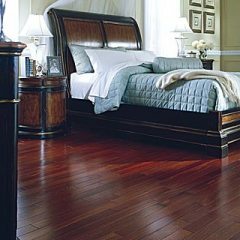 Santos Mahogany Plank can stapled or glued down to wood subfloors or glued to concrete on or above ground level. 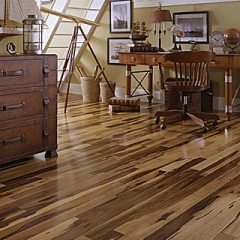 Industparquet Tiete Chestnut Plank 5/16" and 7/16"
Tiete Chestnut Plank is a either a 5/16" thick x 3 1/8" wide or 7/16" thick x 2 5/8" wide, prefinished, solid hardwood floor. It is precision milled for a perfect tongue-and-groove fit with micro beveled edges and ends. This product features a UV cured aluminum oxide Semi-Gloss Finish including a 24-Year Limited Warranty. Tiete Chestnut's color ranges from tan to dark reddish brown coupled with a unique grain pattern and occasional black striping. Its color is mostly unaffected by exposure to light. 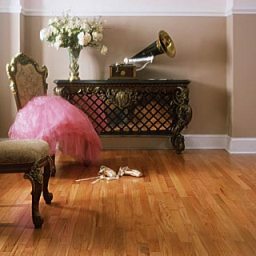 Tiete Chestnut Plank can stapled or glued down to wood subfloors or glued to concrete on or above ground level. 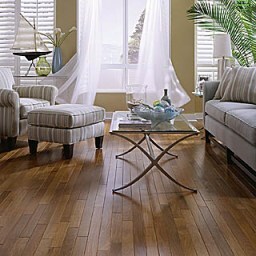 Industparquet Tiete Rosewood Plank 7/16"
Tiete Rosewood is a 7/16" thick x 2 5/8" wide, prefinished, solid hardwood floor. It is precision milled for a perfect tongue-and-groove fit with micro beveled edges and ends. This product features a UV cured aluminum oxide Semi-Gloss Finish including a 24-Year Limited Warranty. This species features a pinkish rose color that gradually darkens over time. Madeira Nova includes a medium to fine grain variation that makes it perfect for a wide variety of applications. 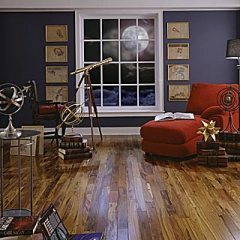 This floor darkens to a rich red rose color with exposure to light. Color stabilizes approximately three months after installation. Tiete Rosewood Plank can stapled or glued down to wood subfloors or glued to concrete on or above ground level. Tigerwood Plank is a 5/16” thick x 3 1/8" wide, prefinished, solid hardwood floor. It is precision milled for a perfect tongue-and-groove fit with micro beveled edges and ends. This product features a UV cured aluminum oxide Semi-Gloss Finish including a 24-Year Limited Warranty. A photosensitive wood, Tigerwood's original color darkens to a deep reddish brown with exposure to light. Tigerwood's orange to reddish brown is accented with bold brown to black striping. 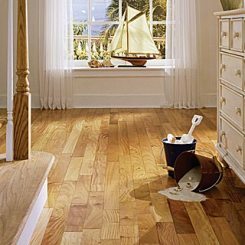 This distinctive striping can vary from fine lines to heavy brush strokes. 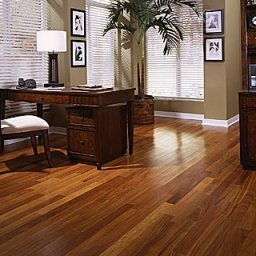 Tigerwood Plank can stapled or glued down to wood subfloors or glued to concrete on or above ground level.